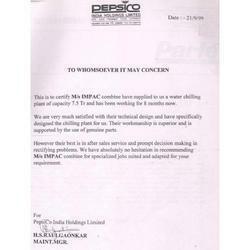 This is to certify that Superchillers Private Limited Have supplied a Brine Chilling unit of 15 Ton capacity with R-404A gas as refrigerant using Bock open type compressor at site Dr. Writer's Food products Pvt. Ltd. In Phaltan Maharashtra. The technical solution for the project was handled on a turnkey basis and been able to deliver the requisite performance from day one. Super Chiller have demonstrated technical capacity of handling sub zero temperature solution. 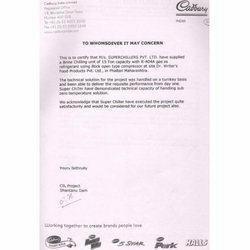 We acknowledge that Super Chiller have executed the project quite satisfactorily and would be considered for our future project also. 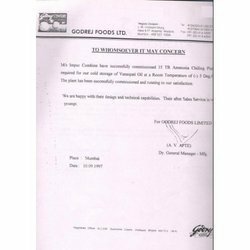 This is to confirm satisfactory installation, commissioning and operation of the refrigeration plant supplied by you to our Silvasa Plant. As you know this has a very prestigious installation and we needed to provide very accurate temperature to the imported high speed machines. I am glad to be able to place on record the full and correct performance of the system exact to specification. I am also to place on record our appreciation for the excellent service from you and all your team. But for your committed service the many difficulties that we encountered could indeed have became insurmountable. Thanks and Regards, Keep up the great work. 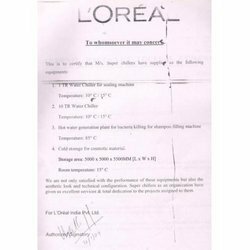 This is to certify that Superchillers Private Limited Water/Brine chilling plant manufacturers and system providers have undertaken and done complete revamping of 35TR chilling plant unit. This plant is working without any problems and giving excellent performance. The system design workmanship and quality has been found to be excellent. We have no hesitation in recommending M/s super chillers for any refrigeration work. M/s Superchillers (earlier Impac Combine) have supplied us water and brine chilling units for various applications in our company. Their chiller units have been used for our de-waxing equipments and tetra-pack equipment including sterilizer and other machines. We have found them extremely technically conscious and have some specific designing for non-standard application. We have compared them with practically every chilling plant manufacturer in Mumbai and found that their prices although higher are actually economical when compared to the quality of material and design considerations taken by them. We are making this statement, as we are extremely happy with their performance and have no doubts regarding the commitment of this company and hence we are issuing such a strong certificate. M/s Impac Combine have successfully commissioned 35TR Ammonia Chilling Plant required for our old storage of Vanaspati Oil at a room Temperature of (-) 5 Deg. C. The plant has been successfully commissioned and running to our satisfaction. We are happy their design and technical capabilities. Their after Sales Service is prompt. M/s IMPAC COMBINE have supplied and commissioned 4 units of 40 TR CHILLING PLANT. They are working satisfactorily for the past one year. This is to certify M/s IMPAC combine have supplied to us a water chilling plant of capacity 7.5 TR and has been working for 8 months now. We are very much satisfied with their technical design and have specifically designed the chilling plant for us. Their workmanship is superior and is supported by the use of genuine parts. However their best is in after sales service and prompt decision making in rectifying problems. We have absolutely no hesitation in recommending M/s IMPAC combine for specialized jobs suited and adapted for your requirements. 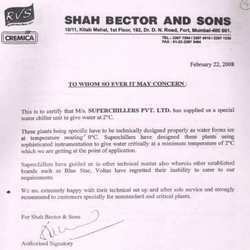 This is to certify that Superchillers Private Limited has supplied us a special water chiller unit to give water at 2°C. These plants being specific have to be technically designed properly as water forms ice at temperature nearing 0°C. Superchillers have designed these plants using sophisticated instrumentation to give water critically at a minimum temperature of 2°C which we are getting at the point of application. 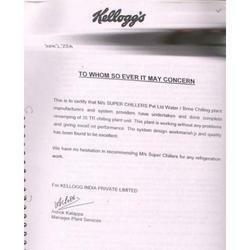 Superchillers have guided us in other technical matter also where in other established brands such as Blue Star, Voltas have regretted their inability to cater to our requirements. We are extremely happy with their technical set up and after sale service and strongly recommended to customers specially for non standard and critical plants. 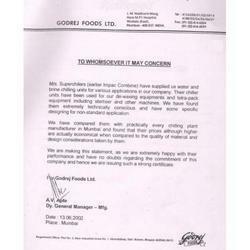 This is to certify that M/s Super Chillers have supplied us the following equipments. Cold storage for cosmetic material. We are not only satisfied with the performance of these equipments but also the aesthetic look and technical configuration. 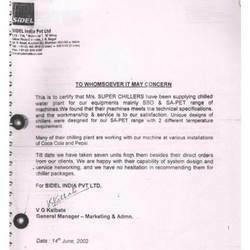 Super chillers as an organization have given us excellent services & total dedication to the projects assigned to them. 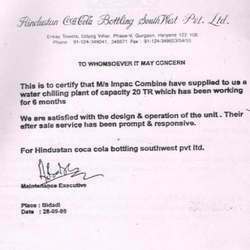 Hindustan Coca Cola Bottling South West Pvt. Ltd. This is to certify that M/s Impac Combine have supplied to us a water chilling plant of capacity 20 TR which has been working for 6 months. We are satisfied with the design & operation of the unit. Their after sale service has been prompt & responsive. For Hindustan Coca Cola bottling southwest pvt. 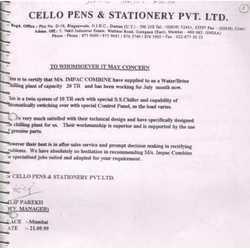 Ltd.
Cello Pens And Stationery Pvt Ltd. This is to certify that M/s IMPAC COMBINE have supplied to us a Water/Brine shilling plant of capacity 20TR and has been working for July month now. This is a twin system of 10TR each with special S.S. Chiller and capability of automatically switching over with special Control Panel, as the load varies. Very much satisfied with their technical design and have specially designed the chilling plant for us. Their workmanship is superior and is supported by the use of genuine parts. However their best is in after sales service and prompt decision making in rectifying problems. We have absolutely no hesitation in recommending M/s Impac Combine or specialized jobs suited and adapted for your requirement. 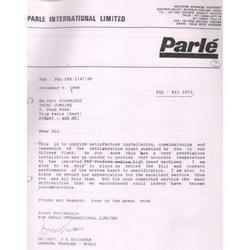 This is to certify that Superchillers Private Limited have been supplying chilled water plant for our equipments mainly SBO & SA-PET range of machines. We found that their machines meets the technical specifications, and the workmanship & service is to our satisfaction. Unique designs of chillers were designed for our SA-PET range with 2 different temperature requirement. Many of their chilling plant are working with our machine at various installations of Coca Cola and Pepsi. 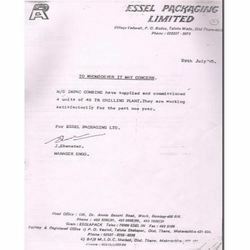 Till date we have taken seven units from them besides their direct orders from our clients. We are happy with their of system design and service networking, and we have no hesitation in recommending them for chiller packages. For Sidel India Pvt. Ltd.